Manufacturer of a wide range of products which include web guiding system - epc. We feel proud to introduce ourselves as the well-known manufacturer and supplier of Web Guiding System ­ EPC. The offered web guiding system is constituted by rectangular steel tubing frames . Our supplied web guiding system is very widely used in the unwinding and slitting machines. The offered web guiding system is available at very affordable and cost effective market rates. We are one of the well-known manufacturers and suppliers of Web Guiding System ­ EPC. The offered web guiding system is specially designed for catering to the slitting operations in textile and rubber industries. Our supplied web guiding system is made from superior grade raw materials, procured from very trusted and reliable vendors in the market. We are one of the widely acclaimed manufacturers and suppliers of Web Guiding System ­ EPC. 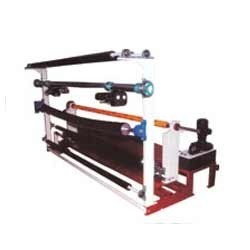 The offered web guiding system is highly acclaimed and appreciated for facilitating the cutting and slitting operations in rubber and textile industries. Our supplied web guiding system is made from high grade iron alloy for ensuring longer life span and durability.